We are providing an intensive training program for fresh IT graduates to build their dream career with us. Our training methodology meets high quality standards and is customised for maximum employability. We follow the latest curriculum and best practices of the industry. After successful completion of training, the candidate can join immediately and start work with ease. Hi I am Reo Paul from Thrissur. After completing my graduation from Chinmaya Mission College , Thrissur, I started trying for a job. But everywhere they were asking for experience and after 6 months of job search with no luck, I decided to do freelancing instead. Here also I met with failure as I did not have the technical expertise required by a freelancer. It was at that time that I heard about AIT's Job Guaranteed Program for freshers. I selected a course in Android programming and underwent 1000 hours of training in the next 5 months. After the course I joined their development company and am working there since one year. Doing the course at AIT has been a life-changing decision for me. 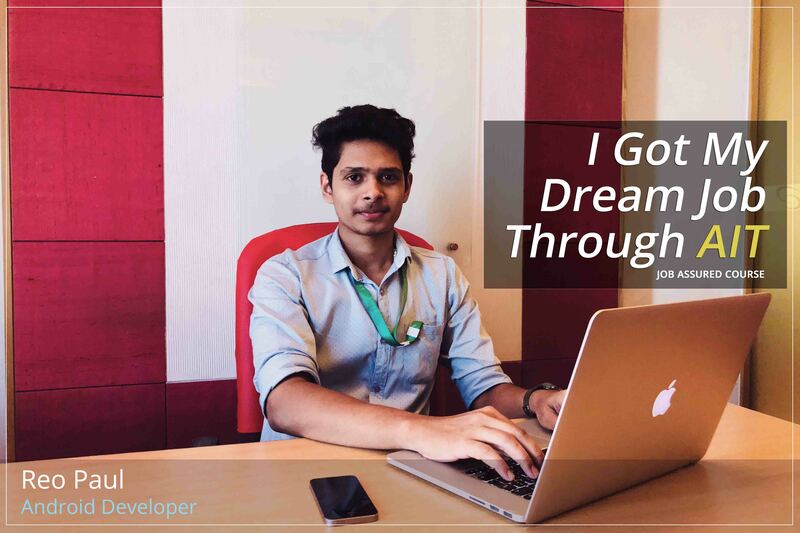 Today I am a successful programmer and confident to rise to new heights in my career. Here are some more of our current employees who got a job through AIT..